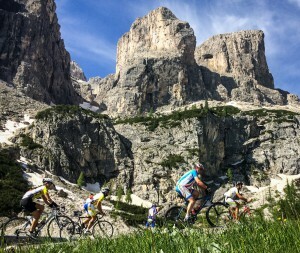 The Sellaronda loop counterclockwise. Once you’ve gone around clockwise you should try this direction, too, in order to see the views that you missed on the descents in the other direction. 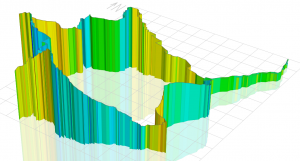 You’ll be thinking that you’re riding a totally different route. This is also the direction that is ridden during the Sellaronda Bikeday that is held every year in June. There’s a fantastic cold water fountain to fill your bidons on the right side of the road. Be sure to fill up because there aren’t any water fountains along the road for quite some time (30 km). 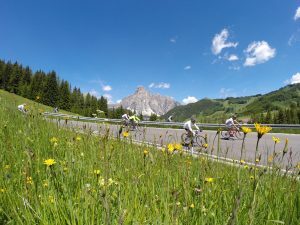 In Corvara, turn right following the signs to Passo Gardena.You’ll go through Corvara. The climb starts towards the town of Colfosco and then heads on towards Passo Gardena. The top of Passo Pordoi,where you can see a monument dedicated to Fausto Coppi on the left side of the road near the gondola station. The Passo Pordoi descent ends in Arabba. Get ready to turn left and climb the last uphill section of this loop: the Passo Campolongo is short, but if you’re tired, remember, it won’t be easy. In Arabba, at the church, there is another water fountain where you can fill your empty bidons. 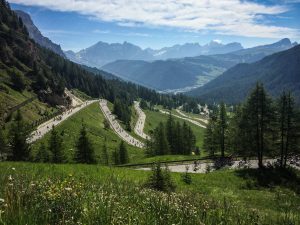 The top of Passo Campolongo – from here it’s a long descent towards Badia passing through the towns of Corvara and La Villa. Igor, thanks so much for sharing your knowledge of the local climbs! I cycled this route today and it was spectacular.